Is your house currently overflowing with dog toys and you are looking for a place to put them all? A dog toy box is the ideal solution for tidying up your home. Not only this, but it keeps the toys safe and ensures that you can bring them out at the times when you are available to supervise your four-legged friend. Since you invest so much money making your dog happy with toys, it makes sense that you have a place where they can be stored safety. With this in mind, this blog post will over a run-through of some of the best dog toy boxes currently on the market, so you can choose the one which is best for your household. A dog toy box which is both stylish and sturdy, it helps you to keep everything tidy while also looking great in your home. Stability is provided by the wire frames, while there are also six plastic inserts along the side to keep the box upright. When you need to carry it around, you can do so with the firm handles on the sides. There is a waterproof coating inside, which helps in case any of the toys get wet. It also makes the job of cleaning the box so much easier. When you are not using it, you can fold and collapse the box easily. Offering excellent floor or under-bed storage, this cloth canvas basket helps you to keep all your dog’s toys in one place. Its trendy design ensures that it is not going to look out of place in your home décor. As for the handles, they are made from faux leather to make carrying it around easy. Inside is a waterproof plastic liner which helps you to keep the toys clean and dry. The open top allows you to access all the toys inside easily. The design of this basket is one of the major selling points. The fabric exterior is printed with cute pictures, stylish artwork, and colored dog commands. The handles are in the shape of bones, which are both attractive and practical. As for the interior, it is made from solid fabric to ensure that it retains its shape. 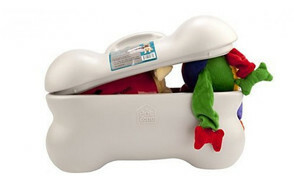 If some of the toys have got a little bit dirty and messy, you can simply wipe the box clean. The bin has been tested to show a high level of resistance to water and sunlight. An upright standing storage box, the materials are made to wipe clean with a cloth whenever you need. At the sides are two bone-shaped handles which make taking it around from place to place a straightforward task. While it is not the biggest box on the market, it can still hold plenty of your dog’s toys and other essentials such as grooming products, collars and leashes. Ultimately, it is an affordable option which does a straightforward, yet effective job. If you would like a giant bone which contains all your dog’s toys, this is the ideal option for you! A secure fitted lid is also included, so you can seal the toys away from your canine’s access. 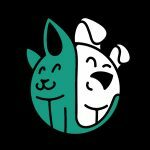 As well as being easy to clean, the box is also food-safe, which means that you can store dry dog food or treats inside. It is the perfect size to keep a host of your dog’s treasured possessions including balls, stuffed animals and more. This cloth canvas storage box with an open lid gives you plenty of space to put all your dog’s things including toys, clothing, leashes and grooming products. While it is a lightweight box, it has reinforced handles which make it easy to carry around as needed. The wire-rimmed edges add an extra level of stability. As for the interior, there is a waterproof plastic lining to add an extra layer of protection, as well as making it easy to clean. The open top means that the toys are accessible at all times. This dog toy box has a charming pawprint design which makes it instantly obvious that it is for your dog. Its large size means that you can fit everything you need inside, and it will all stay in one convenient place where you can easily find it. When it comes to cleaning, all you need is a damp wet cloth or sponge and you will be able to wipe it clean comfortably. As for the lid, it features a hook and loop fastener to keep your pet’s toys safe and secure, as well as making transporting it around much easier. 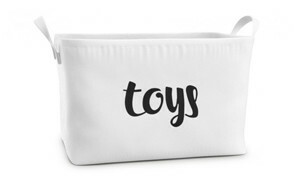 A simple toy box which is made from 100% cotton, you can easily store a large number of your dog’s toys inside. While it is extremely lightweight, the wire reinforcement ensures that it still has the stability to stand alone. As for the handles, they have also been reinforced to ensure that you can pick the box up easily and it is not going to drop. The open top keeps everything inside easily accessible as and when needed. Different to the toy boxes which we have discussed so far, this one is made of wood. The gaps make sure that the toys have plenty of air and the cedar scent keeps everything fresh-smelling. As well as this, they make the box easy to carry around from place to place. Little paws have been etched into the wood which shows that it clearly belongs to your dog. The final product on our list is this toy and accessory bin which stands upright and includes two handles which make for easy carrying. When you want to clean it, you can simply wipe it clean with a damp cloth. The colors and design have been carefully considered to ensure that it goes well in a variety of different homes. Ultimately, it provides the ideal location to store a host of your pet’s treasured possessions! Each dog toy storage device has its own individual set of core features which are all worth considering in closer detail. Here are some of the main points which you should bear in mind. The first point which you should consider is what sort of material has been used to make the box. The strongest and most stable option you can choose is a wooden box. If you have a larger dog who likes to get the toys out of the box themselves, a sturdy design will stop it from getting damaged. On the downside, it doesn’t fold away like other materials. As for fabric storage bins, they have the natural advantage of being more lightweight and portable, but they do not offer the same level of stability. However, if you choose a high-quality fabric such as jute, it is likely to be able to handle some chewing and biting. Alternatively, you could go for a plastic box, but you should make sure that you select a material which is non-harmful to your pet. Dog toys are likely to get all chewed up and slobbery. If you go out in the rain, they are liable to get soaking wet as well. Since your dog toy box is the place where they are all going to be kept, there is every chance that it is going to get very dirty, very quickly. So, it is worth considering how easy the box is to clean. Many of the above options have a waterproof lining to make this task easier. Also, a lot of them direct that you need a damp cloth or sponge to wipe them clean and get them back to looking their best. The question of whether you go for an open or closed lid is not just a matter of personal preference; it also depends on your dog too. If you have an overly excitable pup who is always getting their toys out all the time, a lid will help to prevent them from doing so. Also, there are certain dog toys which are not suitable for your dog without your close supervision, and you may decide that you need to seal these off. On the other hand, you may have a dog who you are happy to let access their toys anytime. Plus, it can be fun to train your dog to recognize the name of a certain toy and bring it to you on command. The size of the toy storage box that you choose depends on two factors: how much space you have and how many dog toys you own. Before you make your purchase, you should consider this pair of points as you don’t want to end up with a dog toy box which is not the right size to suit your needs. 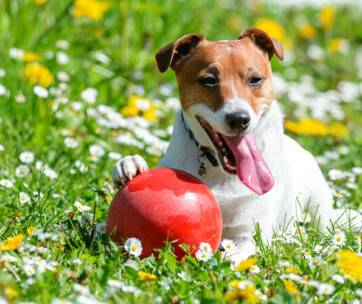 From time to time, you may need to bring your dog’s toys around to different places. Check the handles to see how sturdy they are and how well they are going to be able to withstand the task of supporting the weight of the toys. If you have a larger and heavier dog, a toy organizer which is too flimsy can end up crumbling under their weight as they root around to find their favorite toy. But if you have a smaller pup, they may struggle to get into a box which is sturdy and inflexible. A dog toy box is a simple addition to your household, but it is one which comes along with a host of benefits. In the following section, we will discuss some of these in more detail. The most obvious benefit is that you can declutter your home from all the balls, leashes, stuffed toys, and anything else which belongs to your dog. This reduction in clutter helps to keep your home tidy and ensures that everything is easily accessible in a single location. There are also plenty of mental health benefits which have been closely linked to a cleaner house. First, it has been shown to have a de-stressing effect, as well as one which helps if you would like to practice meditation. If you work at home, tidiness has some particular benefits including increasing your productivity levels and sparking off your creativity. Finally, a less cluttered home helps to reduce fighting in your home as you are not blaming each other for lost possessions. When you have all sorts of loose objects lying around your home, there is every chance that someone in the household is going to trip over them and do themselves an injury. The last thing that you want is to sprain your ankle on your dog’s leash when you were trying to rush out of the house to work! A dog toy box gives you a place to put all these potential tripping hazards and keeps them out of harm’s way. Rather than spending a long time searching for your dog’s favorite toy or delaying a walk because you can’t find their collar, a dog toy box allows you to keep everything in a single place. This will save you a lot of time trying to hunt things down and will also save you a lot of stress in the long-run. Otherwise, a toy could go missing, leading you to buy a new one, only to find that the original turns up several months down the line! As we mentioned earlier, it is an extremely fun and rewarding activity to train your dog to recongize the name of their toys and bring them to you to play with. You can even train your pooch to put their toys back again, which saves you so much time and energy as opposed to having to tidy up after them all the time! We will talk a little bit more about this in the frequently asked questions section, so scroll down the page if you are looking for more information on this now. If your dog’s toys are left out all the time, there is every chance that they are going to get damaged, whether they get sucked up in the hoover or your pup simply chews them up too quickly. A dog toy box is a great way to give the toys an extra layer of protection, which makes it more likely that they are going to stand the test of time and stops you from constantly having to buy new ones all the time. There are many dog toys out there which are not suitable for playing without supervision. Rather than leaving them out and risking your dog doing themselves an injury, keep them on a single place and you will be sure that your dog only has access to them when you are on hand to supervise. While we are on the subject, you should always read the instructions before you provide anything for your dog to play with. Watch out for any loose parts which get chewed off as these could present a potential choking risk to your four-legged friend. We all know that a dog’s drool and slobber doesn’t smell all that great. And since your hound has many of their toys in their mouth so often, they are bound to start to smell over time. Not only this, but you also take many of these toys outside where they can get wet and dirty. Choose a toy box with a lid and you can seal this smell off and stop it spreading to the rest of your home where it can linger for a long period of time. We all know what that wet dog smell is like, and if you can keep it away from your furniture, this is always going to be a plus! If you have young kids in the house, you will want to keep your dog’s toys out of their reach in a dog toy basket. Otherwise, there is a chance that they could cause themselves an injury. If you choose a toy box with a secure lid, this adds an extra layer of protection and ensures that your little boy or girl will not be able to get their hands on anything that they shouldn’t. Looking after your dog’s toy box is important in ensuring that it stands the test of time. First of all, you need to choose the right location for it. If you have an overly-excitable pup, you should keep it well out of their reach where it is much less likely to get chewed up and destroyed. However, if you trust your dog to be sensible, then it is fine to keep it on the floor. Much of the task of maintaining your dog’s toy box involves cleaning it on a regular basis, so follow all the directed instructions to keep it looking at its best. As well as keeping your dog bin organizer in tip-top shape, it is also important that the toys themselves are well looked-after. When you first buy a new toy for your doggy, you should supervise them closely to make sure that they are playing safely. Check the instructions and watch for any bits which have broken off and present a choking risk. You also need to clean the toys. Some are machine washable, while others need to be cleaned by hand. Again, it is worth checking the manufacturer’s recommendations, so you know what you have to do. Q: How can I train my dog to use a toy box? A: Training your pooch to use a dog toy bin takes a little bit of patience and a lot of treats! Before you can do this, you are going to need to do some preliminary work teaching your dog ‘take’ and ‘drop’ commands. Essentially, this involves offering the toy to your dog and saying ‘take’ and encouraging them to put it down by saying ‘drop’. You will need to offer them plenty of treats and encouragement to reinforce this behavior. Begin by giving your dog a toy to put in their mouth. Next, put some treats inside the box. Now, you can guide your pup to the box to show them the treats inside. Hopefully, they will drop the toy inside the box to pick up the treats. When they do this, you need to use a command to reinforce the action and increase the odds that they are going to repeat it. 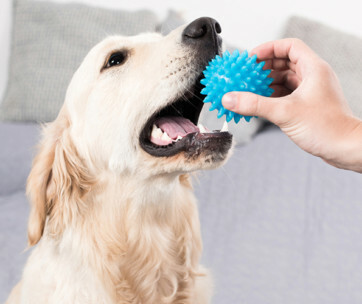 Over time, you should be able to get your dog to put the toy in the box without needing treats as a stimulant. Dogs need consistency when you are trying to train them to do anything, so keep the toy box in the same place and keep your command consistent. If you confuse your dog, this is likely to set the whole process back. Keep them more motivated by choosing a treat which you know that they love to make the activity worthwhile to them. 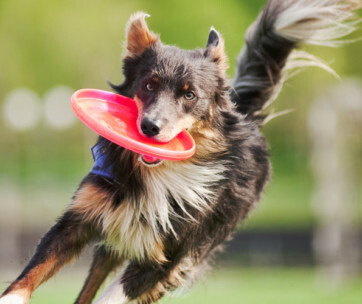 If you want to go one stage further, you can attempt to teach your dog the individual names of their toys, so they can fetch them at your command. Although it takes some time and effort, dogs can actually understand many words if you continue to train them over time. Q: Would these be suitable for outdoor use? A: The short answer to this question is that it depends on the individual box that you choose. While the fabric-based toy boxes are unlikely to withstand the rain very well, the wooden and plastic ones will. However, if you choose one which has an open lid, you will need to put it under a sheltered area like a porch to make sure that everything stays dry and protected. This is certainly the case if you plan on moving the toy box around inside and outside. If you are going to keep the box outside all the time, consider what sort of toys you put in there and whether they are able to withstand the elements as well. You don’t want to risk causing them any unnecessary damage. This large dog storage box takes our number one spot of best dog toy storage devices. As well as being stylish, it is also big enough to keep all your hound’s treasured possessions. The construction is sturdy thanks to the six plastic inserts and wire-frame which keep the bin standing upright. The durable jute material means that it is not easily ripped or punctured. As for the inside, it is waterproof which makes it easy to clean when needed, as well as offering an extra layer of protection to the toy box itself. If needed, you can collapse the box and put it into storage or take it around from place to place. 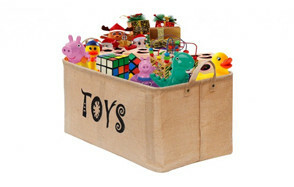 Ultimately, it is a high-quality toy chest which does the job extremely well.